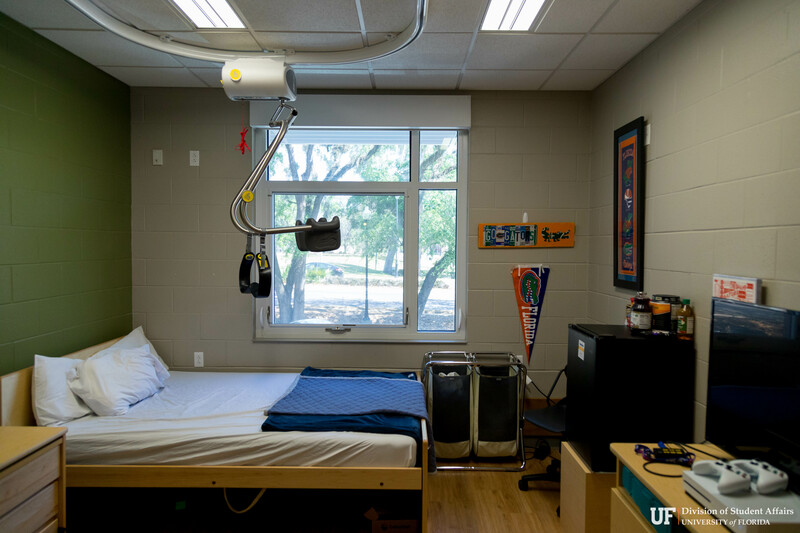 Enhanced rooms that include SureHands lift systems to aid in the transportation of students with mobility impairments throughout their residence hall rooms. Flexible restroom configuration includes zero-entry shower, moveable sinks, grab bar, and bidet. Adequate floor space to accommodate students who utilize mobility equipment and/or who require personal care assistance. State of the art technology system with controlled access to residence hall room including easy access to video equipped doorbell, window blinds, lights, etc. Success strategies and goal planning meetings. Transition into the workforce planning meetings. Independent Living Skills and managing personal care attendants. Additional availability for walk-in hours at the Disability Resource Center. Campus accessibility assessments each semester based on course schedule. Resources regarding funding and support based on individual needs. To schedule a tour of discuss Cypress Hall, email Jenna Gonzalez, Associate Director, at jgonzalez@ufsa.ufl.edu.